On their Twitter account, Cloudfone officially announced that their most awaited octa core Android smart phone. It is finally here and soon to be available on your respective nearest tech stores. I believed this was teased middle of this year but it was not able reach on store shelves early. And now it’s a perfect timing for this model to come out as the Christmas season is approaching. Add this up on your “to buy” list so your love ones may look on it and make that to reality. What’s with Cloudfone Thrill 600FHD? Guys, it’s a 6-incher smartphone with octa core processor powering on it to deliver the task you want smoothly. The wider and bigger screen size leaves you no worries on zooming plus the full high definition resolution (1080x1920) and IPS technology backing up to make everything clear as you wanted. Since Android Lollipop is not yet rolled on our local manufacturers, Cloudfone loads up Android KitKat for this latest device. 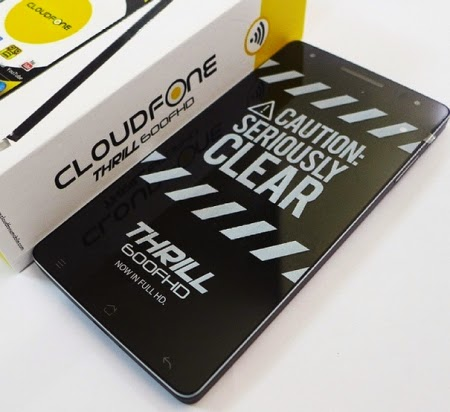 For the price of Cloudfone Thrill 600FHD, we haven’t heard and read official announcement from the company but if you have idea on how much will it cost then don’t hesitate to comment below. There are lots of goods on this device, so if you have plan to buy this one go check out some reviews and hands on from other tech bloggers out there.